Sharpening and unsharpening are popular digital image processing techniques that help retouch an image and can direct the viewer's attention on a particular subject or section. 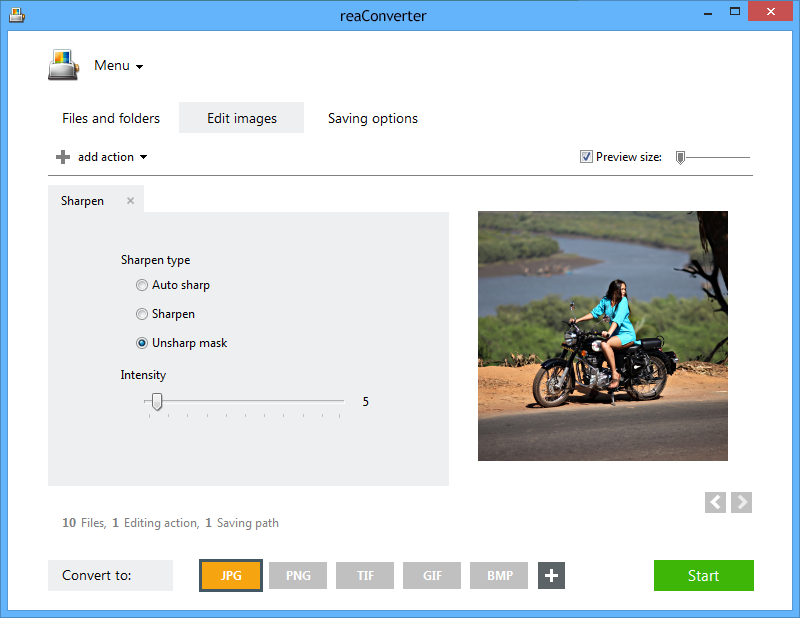 While some people think that sharpening requires a piece of advanced image editing software, with reaConverter's latest edition this editing feature can be applied to one or more images in just a few seconds. Unsharp masking is a photographic technique used well before the digital age and it implies a combination between a blurred copy (or "mask") of an image and its negative. The result is a clearer image, in which more details can be distinguished. Sharpening and unsharp masking are often used as tools to improve the apparent resolution of a digital image, making it less grainy and more precise. Open all the photos you intend to edit by selecting them one by one manually, adding an entire folder or using the drag-and-drop tool. Here you can pick your favourite sharpening type by ticking one of the 3 available buttons and checking their effect in real time in the Preview area. The intensity of sharpening is also customizable using a handy scroll bar placed below. Go go the Saving options tab and opt for the location and format of your output images. You can save them in a customized local folder, in the source folder or in a new subfolder. 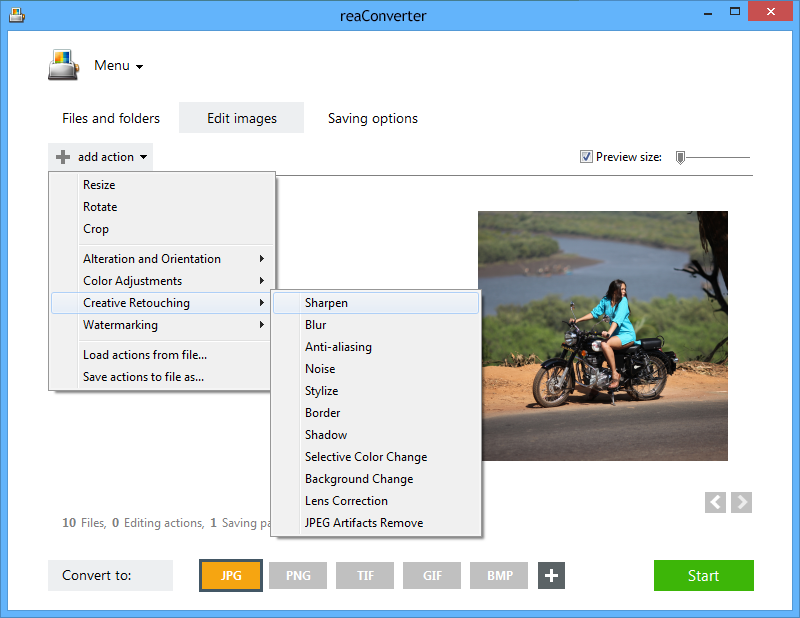 reaConverter also allows you to save output images to your cloud folders using your Google Drive, SkyDrive, Box.net or Dropbox account. In case you want to use this software as more than just an image processing tool, reaConverter supports fast conversion between over 40 types of image extensions, including both popular and archaic or rare ones. 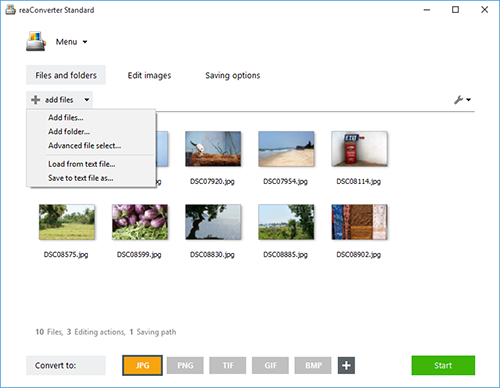 Simply click on one of the buttons in the lower part of the window to opt for format conversion, and then press the Start button to complete the editing process. Command-line sharpening tool is an advanced feature meant for professional use, and is available in Pro edition only.